Do Superfoods Help In Weight Loss? Superfood is a marketing term that is used to denote foods that have a lot of health benefits. Superfood is a marketing term that is used to denote foods that have a lot of health benefits. A food is said to be a superfood when it has high nutrient density and comprise of bioactive components that is loaded with health benefits. There are a lot of proven benefits for losing weight through superfoods. Dr. Steven Pratt in his book named “SuperFoods Rx: Fourteen Foods That Will Change Your Life,” pointed out that superfoods are classified through three qualifications. The first pointer is that it should be readily available to the public; it must have nutrients that would boost longevity; and health benefits that are supported with factual information from scientific researches. 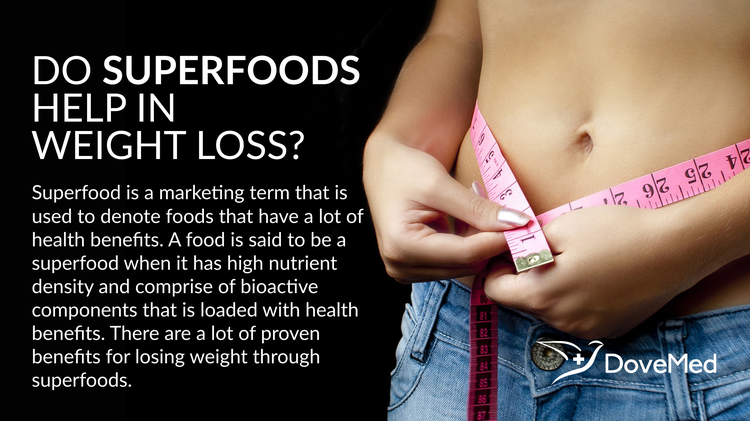 When superfoods are taken as a part of the daily diet, it can go a long way in helping one to lose their extra flab. Superfoods are packed with high volumes of vital nutrients, and most of these are low in calories. Not just fighting obesity, consumption of superfoods also help in reversing known effects of cardiovascular diseases, diabetes, hypertension, and certain types of cancers. Many fruits and vegetables form a part of the superfood family. Not all types of fruits and vegetables lead to weight loss, but most of them do. According to the United States Department of Agriculture’s MyPlate initiative, the recommended serving for adults is 1.5 to 2 cups of fruits every day, and 2 to 3 cups of vegetables on a daily basis. Consumption of dark, green leafy vegetables can help in losing weight in a healthy way. These vegetables are filled with plenty of vital minerals, vitamins, and other chemicals that protect the human body from diabetes, heart diseases, and other illnesses. The water content in the green leafy vegetables helps flush out toxins from the body and help the human body detox. A serving of spinach contains only 20 calories and is powered with vitamins A and C and folate. Green tea, a superfood, is rich in catechins and polyphenols that are natural oxidants. There are several studies that show the preventative effects of polyphenols against weight gain and obesity. A research which was published online in Molecular Nutrition Food Research mentioned that voluntary exercise when combined with consumption of green tea extracts showed considerable weight loss. Consumption of superfoods can make you feel better and provide a healthier quality of life. Superfoods allow one to sleep properly and wake up with vigor and energy. A proper sleep through the night is helpful in weight loss. Superfoods help maintain the body clock, giving you a regular day and night pattern that is more amenable to attaining one’s weight loss goals. Considering the nutrients that are packed in different types of superfoods, they may be said to contribute to weight loss through various ways. Wolfe, D. (2010). Superfoods: the food and medicine of the future. North Atlantic Books. Herzog, D. (2014). Jumpstart! : Your Way to Healthy Living With the Miracle of Superfoods, New Weight-Loss Discoveries, Antiaging Techniques & More. Charisma Media. Pratt, S., & Matthews, K. (2006). Superfoods Healthstyle. Random House. Halim, G., & Russo, S. (2011). Healing Foods, Healthy Foods: Use superfoods to help fight disease and maintain a healthy body. Hachette UK.